Although I′ve already mentioned the Penguin update in this chapter, I′d like to stress once more that such spammy link signals as: advertising text links with exact match anchor text, comment spam, content on article marketing sites, and links from low–quality sites were the main indicators of websites, using manipulative SEO tactics. So now it′s time to talk about how you can avoid it and save your website from penalty, together with the backlinks you′ve invested time and resources into. If you follow these simple tips, your site will be only gaining rankings in post–Penguin Google. As I′ve already mentioned, Penguin does NOT tolerate hundreds of backlinks with anchors exactly matching commercial terms. So do your best to diversify the anchor texts so that they include not just the keywords you gain profit from. 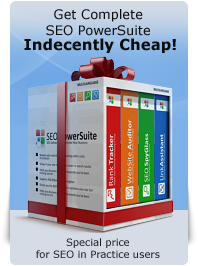 To quickly have a look at your existing anchors, you′ve got SEO PowerSuite at hand. Launch SEO SpyGlass, create a new project for your domain and let the tool collect the data for you, including all of your anchors. 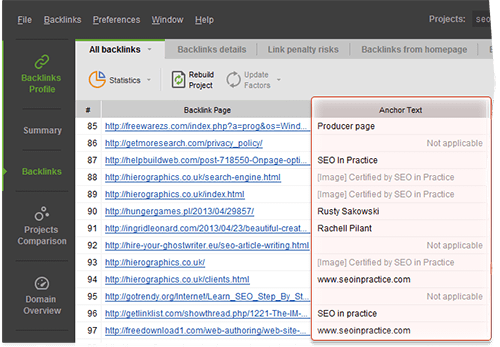 Today, the diversity of the backlink profile plays the key role in a successful withstanding of another major update. And you can weather another storm only if your SEO strategies are diverse. Yet, what exactly does this mean? Domain diversity — basically, it′s better to have 2 links on 2 different domains, than 4 on 1. Besides, you′ll benefit more by having backlinks from sites with different extensions. If there are links from .com, .net, .org, .edu and .gov sites, Search Engines may think it appeals to a variety of audiences. Domain IP diversity — if websites are hosted on the same server, it′s very likely they′ll have the same (or similar) IP address and that′s not what you′re looking for. Domain age — an old domain seems to be more credible for Search Engines, and if all of your links come from newly registered domains — that′s an alarming sign. And try to get backlinks from various sources — blogs, press releases, forums, Q&A sites, video platforms (YouTube, Vimeo), podcast websites, social media sites (Twitter, Facebook, LinkedIn). Of course, collecting these data manually may take weeks of hard and boring work. 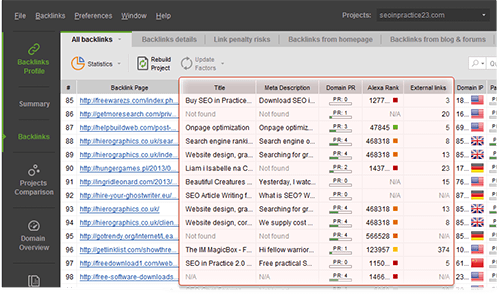 With SEO SpyGlass you can collect all the backlink domain–related information in a couple of clicks! 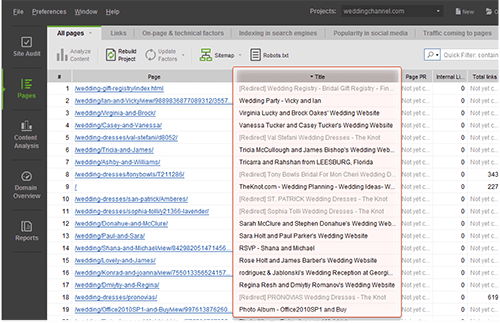 Titles and descriptions of the linking pages — the more relevant they are to what your website offers — the better! The number of outbound links on a linking page — As the PageRank is proportionately divided between all links on a page, it′s useful to know how many outbound links it has. The fewer, the more profitable a link from this page will be for you. The overall domain popularity — check the PageRank, Alexa Rank and other metrics you are interested in to see how well is the overall performance of a particular website. Dofollow/nofollow backlinks ratio — although nofollow backlinks are not counted by Search Engines, the backlink profile looks more natural when it contains links of both types. 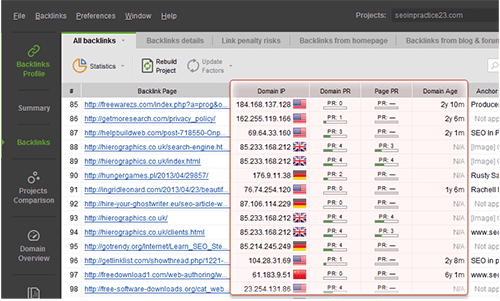 And again, SEO SpyGlass is your number one tool to quickly get the most thorough data for your backlinks. 4) Okay, what else can you do? Eliminate keyword stuffing issues: with the help of WebSite Auditor calculate the ideal keyword density — the one used by your currently top–ranking competitors. If that technique lets your competitors rank top, it′s time you take it on board! Eliminate duplicate content: make sure all of your pages have unique titles and Meta descriptions. This can be easily checked in WebSite Auditor too. Just launch it and rewrite duplicate tags if there are any. 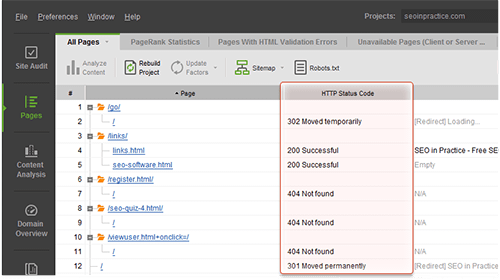 Fix broken links — if there are pages with 404 or 302 status codes, you′d better redirect them to other relevant live pages (using 301 redirect I′ve already mentioned). If you don′t do this, besides losing visitors and robot′s attention, you may lose the link juice from links pointing to these broken and 302–redirected pages. Reevaluate internal links — make sure the anchors of your internal links are relevant and contain keywords, but are not stuffed with them. Optimize the size of the landing pages — if your pages take too long to download, users are likely to return quickly to the search results page, which is not a good sign for Google. 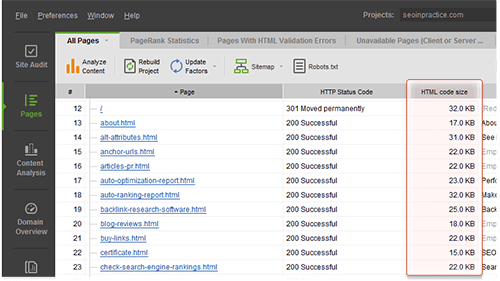 As you can see, all these tasks can be performed by the WebSite Auditor, which arranges tons of data in a neat form and all you have to do is just to pass these reports to your webmaster or fix these issues yourself. Thanks for writing such a good article in the form of tips for seo of a website. It is not clear how many ways a seo can be possible to viral a Domain or URL like <a href="http://www.birchi.in">carved wooden furniture</a>. People always try direct method but most of time these trick don't works for SEO. Your tips are helpful for the person to make good website optimization for me and my websites or blog. This content is so valuable and surely unique that people are happy and really helpful for them. any pressure from your side, neither in the form of request nor hint or reminder in any ways. Thank you so much for this informative post. I found your site as a perfect platform to get good contents to read. I would love to say that the contents which you are sharing on your site are very opting and easy to understand. This factor makes the reader refer your site more and more. A great online page of the SEO and which keen tips actually you mention here I did't get any where. Here I realize A biggest opportunity for the learner.